Paul and Sue Edgerton will celebrate their 50th wedding anniversary September 3rd. 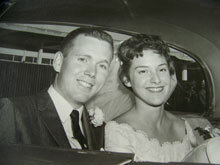 They were married in Palo Alto, CA, on September 3, 1960, while they were students at the University of Idaho in Moscow. They have four children: Patricia Carrell (Gerald) of Maple Valley, WA; David Edgerton (Terrance Wagner) of Seattle, WA; Michael Edgerton (Jenny) of Bend; and Kelly Richards (Dan) of Bothell, WA. They also have 7 grandchildren. Paul worked as a research biologist for the U.S. Forest Service in LaGrande and Wenatchee, WA, and Milwaukee, WI. Sue worked at two colleges and also in insurance, as well as working as a volunteer in many capacities. They moved to Sisters from Friday Harbor, WA in 2002 and continue to volunteer in the community at the library, Habitat for Humanity and Deschutes Land Trust. They will celebrate with trips to Lake Chelan, WA and Costa Rica. Dear Paul and Sue, Congratulations on reaching fifty years of marriage. You've lots to be happy about---four great kids---successful careers---fun retirement years---and (reasonably!) good health. Have fun in Costa Rica, that's one of our favorite spots and we went there with our kids and grandkids to celebrate our 50th. Best wishes, Jon and Donna This comment has been hidden due to low approval.